Diffusers are normally used on the rear wall, but in this case it is all glass and the seating is quite close to it, so three diffusers will be mounted on the front wall instead. If these are a success, two more may be built to fire the roof mounted surrounds into. 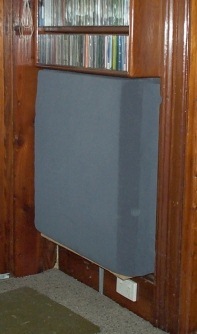 Wall mounted diffusers. Bass trap at RHS of picture. The mains are hidden inside the IB manifolds. Purists would say this cuts down on the breathing for the IB but it's got more than enough power for this little house. It took 3 sheets to do the absorbers shown in the drawing at the top of this page (apart from the one in the middle of the side wall, which is somewhere off in the future). This is best sourced wholesale from your local rubber and latex dealer, who will charge you about 1/3 what an audio shop would. This room is wider than it is long, meaning that the seating position is up against the back wall, and the surround speakers will be to the left and right of the seating position. 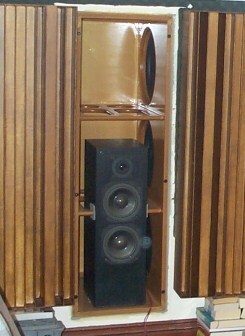 Being so close to the back wall, bipole speakers would tend to have echo problems with the rear firing driver. Some articles on Dolby 5.1 and THX processing suggest that de-localising the sound coming from the rear is beneficial. 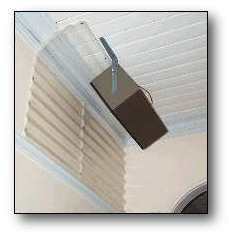 The surround speakers were turned around, and the sound bounced off these polycarbonate panels made from some left-over roofing sheets. It seems to work well for background sounds such as rain and crowds. Some proper QRD diffusers are likely to replace these soon. Bias lighting is the technique of placing a light behind your TV screen. This will provide background light via the wall behind the TV, and done correctly, will increase contrast and reduce eye fatigue by moderating changes in brightness in the room. If you're on a limited budget, and don't want to import stuff from the other side of the planet, grab a cheap light dimmer from the local K-Mart and mount it in a box with a lead and an outlet socket. Use a lamp with one of the "bendy" necks to illuminate the area behind the TV - the results are great. Room nodes Calculator from Bob Gold. Room EQ Wizard software written by John Mulcahy. You will have to become a member at Home Theater Shack to access the software. (Membership is free) They also have a well supported set of discussion forums. The software will even upload the new settings into the BFD via the MIDI port on your computer. To open pdf files, you will need Acrobat Reader.